More Details Four-piece bedding set includes: one comforter (110" x 96"), one dust skirt (78" x 80" with 18" drop), and two shams (20" x 36"). Polyester jacquard. Machine wash. Imported. More Details Four-piece bedding set includes: one comforter (110" x 96"), one dust skirt (72" x 84" with 18" drop), and two shams (20" x 36"). Polyester jacquard. Machine wash. Imported. More Details Four-piece bedding set includes: one comforter (92" x 96"), one dust skirt (60" x 80" with 18" drop), and two shams (20" x 26"). Polyester jacquard. Machine wash. Imported. More Details Four-piece bedding set includes: one duvet (110" x 96"), one dust skirt (72" x 84" with 18" drop), and two shams (20" x 36"). Polyester jacquard. Machine wash. Imported. More Details Four-piece bedding set includes: one duvet (92" x 96"), one dust skirt (60" x 80" with 18" drop), and two shams (20" x 26"). Polyester jacquard. Machine wash. Imported. 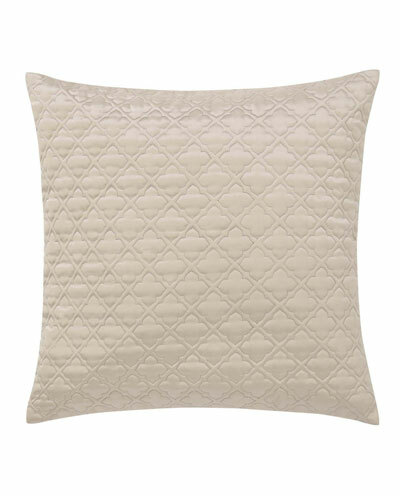 More Details Faux leather (polyester) quilted pillow. Spot clean. 18"Sq. Imported. 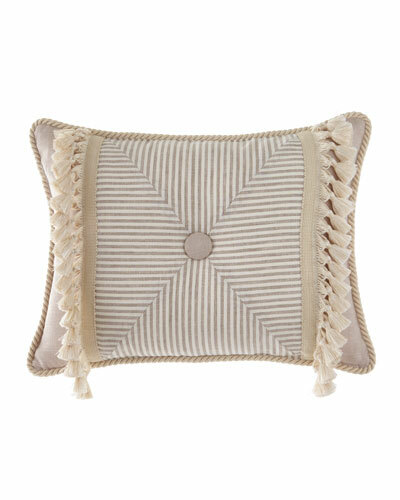 More Details Pierced oblong pillow with button center. Tassel fringe accents. 15" x 20". Cotton/linen/rayon/polyester; polyester back and fill. Dry clean. Made in the USA of imported materials. More Details Soft fleece pillow with gradient embroidery. 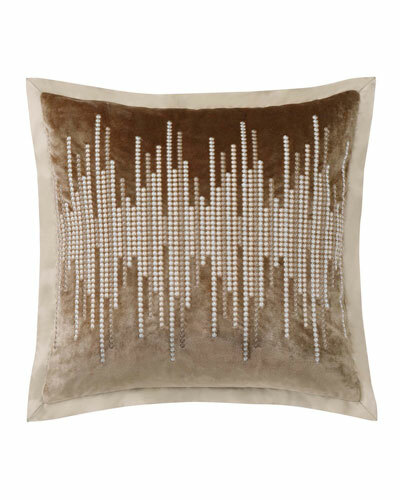 Faux silk flange. Polyester. Spot clean. 28"Sq. Imported. More Details King duvet cover with hidden zip closure. 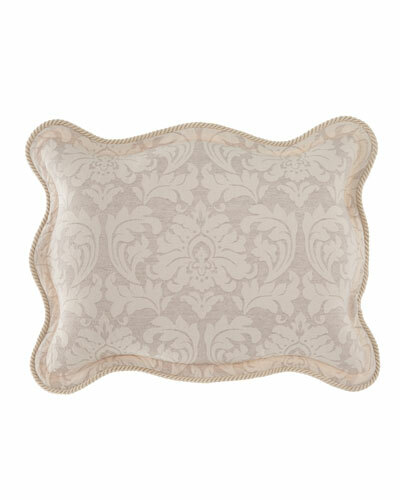 Allover damask with scalloped edge. Front, cotton/polyester/linen/viscose; back, polyester. 106" x 96". Dry clean. Made in the USA of imported materials. More Details Queen duvet cover with hidden zip closure. 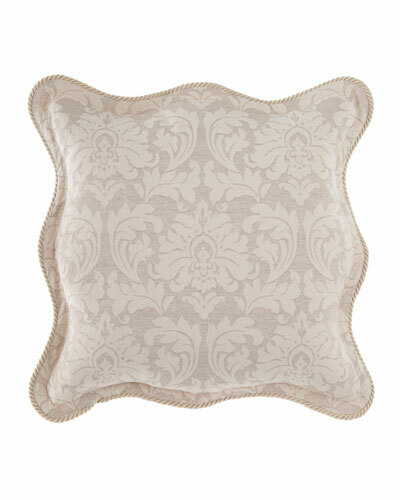 Allover damask with scalloped edge. Front, cotton/polyester/linen/viscose; back, polyester. 96" x 92". Dry clean. Made in the USA of imported materials. 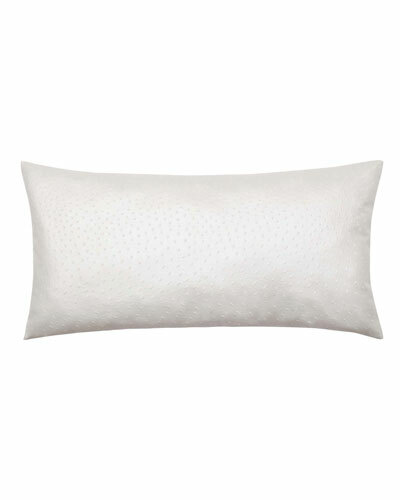 More Details Pillow with Swiss dot embroidery. Polyester. Spot clean. 14" x 22". Imported. 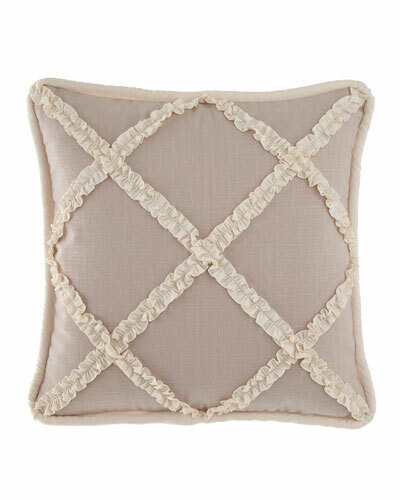 More Details Linen pillow with ivory ruffle accents. Piping finished edges. 20"Sq. Front, cotton/polyester/linen/viscose; back and fill, polyester. Dry clean. Made in the USA of imported materials. More Details Allover damask sham with scalloped edge. Hidden zip closure. 19" x 25". Front, cotton/polyester/linen/viscose; back, polyester. Dry clean. Made in the USA of imported materials. 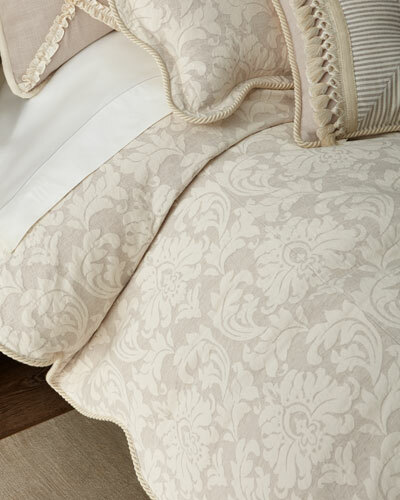 More Details Damask European sham with flange and scalloped edge. Zip closure. 25"Sq. 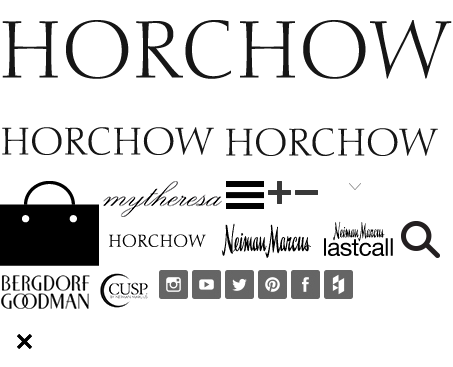 Front, cotton/polyester/linen/viscose; back, polyester. Dry clean. Made in the USA of imported materials. More Details European sham with ivory ruffle trim. Piping finished edges. 25"Sq. Front, cotton/polyester/linen/viscose; back, polyester. Dry clean. Made in the USA of imported materials. 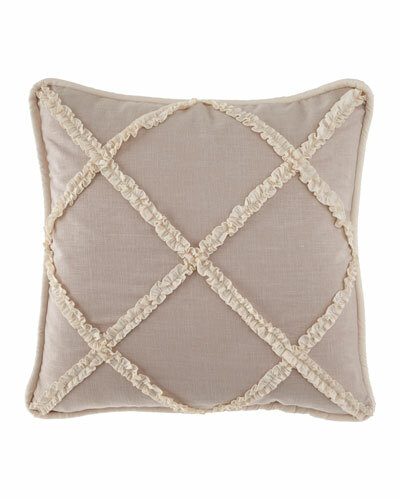 More Details King sham with scalloped flange and cording trim. Hidden zip closure. 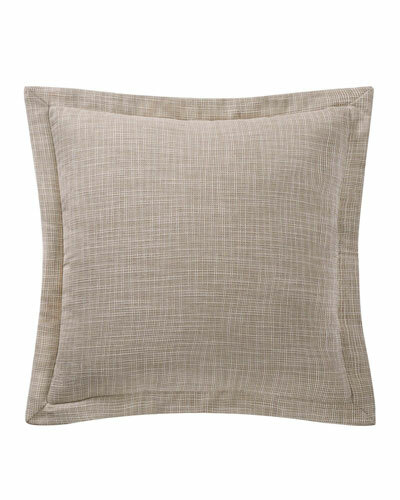 Front, cotton/polyester/linen/viscose. Back, polyester. 19" x 35". Dry clean. Made in the USA of imported materials. More Details Crosshatch sham. Self flange. Polyester. Spot clean. 26"Sq. Imported. 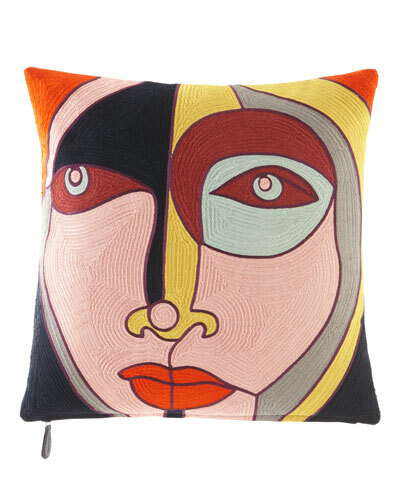 More Details Paloma pillow. Polyester. 20"Sq. Dry clean. Imported. 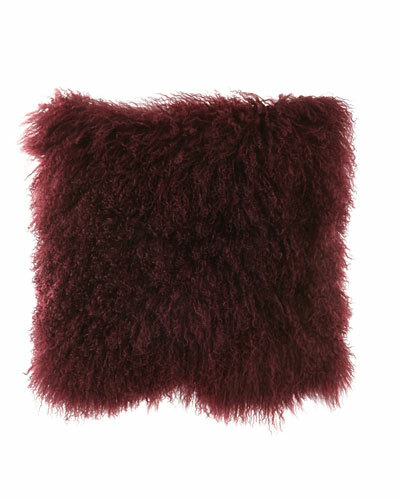 More Details Pillow made of dyed Tibetan lamb shearling (China). 20"Sq. Down/feather fill. Polyester back. Made in the USA of imported materials.